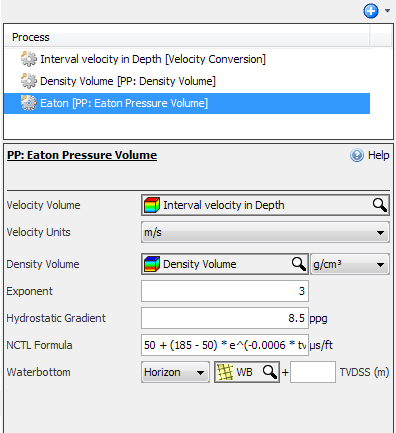 Description Calculate pressure (in psi) and pressure gradient (in ppg) using Eaton's equation. The Eaton equation is a technique used to estimate pore pressure in 3D. This process creates new volumes of pressure (in psi) and pressure gradient (in ppg) using Eaton's equation. To fully read and understand the fundamental theory behind pore pressure analysis and Eaton's equation, see the Pore Pressure Prediction chapter. 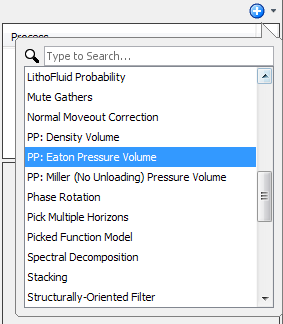 Double-click PP: Eaton Pressure Volume. Exponent — The exponent (Exp) in the Eaton equation. Hydrostatic Gradient — The pressure gradient resulting from a fluid (water) column at equilibrium due to the force of gravity. Hydrostatic pressure increases in proportion to depth measured from the surface because of the increasing weight of fluid exerting downward force from above. ΔTm is the compressional transit time in the zero porosity shale matrix (default = 50). ΔTml is the mudline transit time (default = 185). c is a constant (default = 0.0006). tvdbml_m is the depth below mudline in metres. Waterbottom — A constant depth or a horizon. This is required if the NCTL function is defined in terms of tvdbml. If a horizon is chosen, a constant value can be used to offset the horizon.